Happy new year! 2017 has finally arrived and I'm pretty excited for what's to come. Each year, I always set a list of goals for myself that range from personal, health, travel, and business. For my business this year, I'm really looking to add more folks to my clientele and create an awesome experience for anyone I work with. I'm also doing a lot of learning and development, so that I keep up with new technology and make workflows easier for myself. 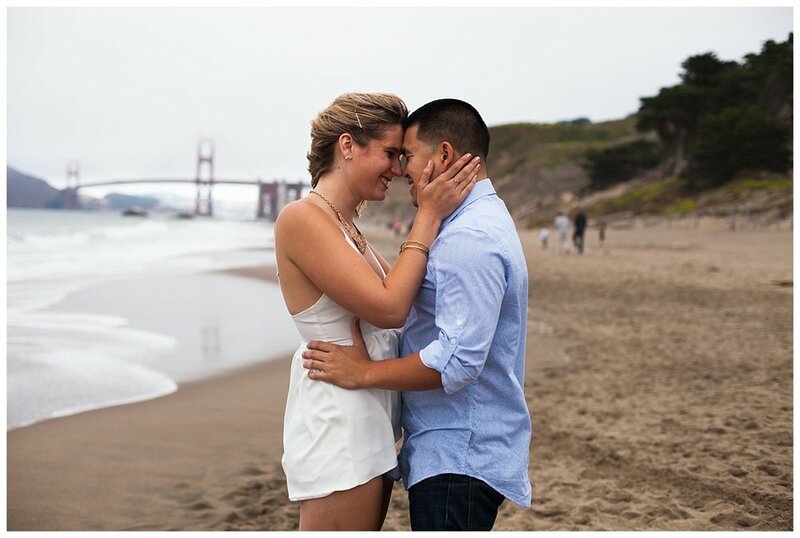 I also like to reflect on highlights of the past year, and one of those what doing an engagement session with my long time friends Kendall and Roi. My boyfriend actually introduced them after him and I started dating. So I've been able to see the full development of their relationship and it makes me SO happy that I got to document this time in their lives. As Bay Area locals, they wanted to capture the essence of San Francisco and use the city's landmarks as gorgeous backdrops. We first stopped by Baker Beach, and true to form, there was fog rolling into the bay. I thought it looked cool with the bottom half of the Golden Gate Bridge peeking from under the fog. We then made our way to the Palace of Fine Arts and wandered around the gardens. M.J. their super cute pup also joined us. She's happy that her fur parents are finally tying the knot! Kendall and Roi- Thanks for having me document this time in your lives. You two are family to me and I can't believe you're getting married! SO grown up. ;) I can't wait to keep celebrating your engagement and marriage later this year. This year's booking dates are open, so please reach out if you have any questions! I'd love to capture your love story.